I fondly remember Roy when working with him in OTC during a long period of time, (1966 to late 1987). Our contact involved pleasant discussions about work, and sometimes the time slipped by in discussing daily events and maybe a few funny jokes. We always shared a few drinks during the many Christmas Parties. My condolences to his family. 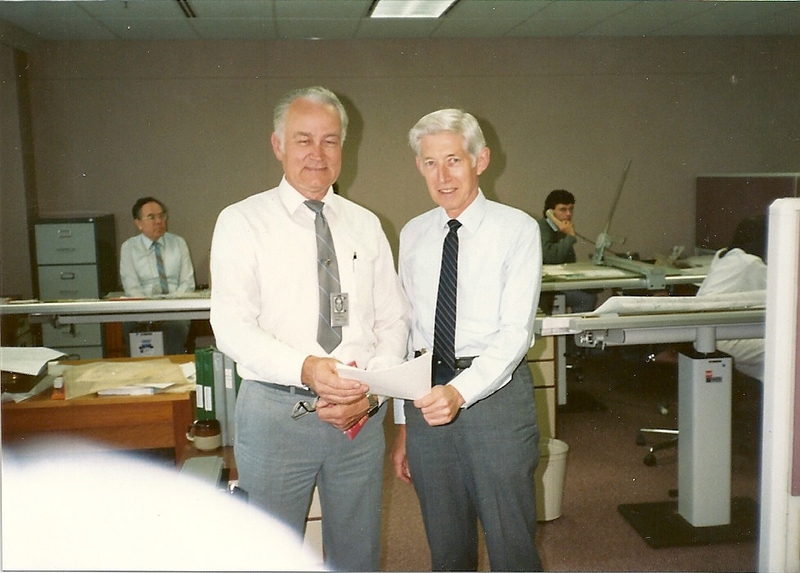 I attach a photo of us together in the Drawing Office where he was Chief Draftsman. It was the last consultation that I had with him, 2nd October, 1987. Vic Strelcs. Bateau Bay, NSW. 12th April. 2019. Brian Hayes and I attended the Funeral of Roy last Friday. Brian has been a close neighbour of Roy’s at Maroubra. Roy’s wife, being slightly younger than Roy, and her daughter (she provided the eulogy) and, in turn, her daughter, all expressed their joy and appreciation at the attendance of two of Roy’s past colleagues. His wife is very bright and very able and was inquiring about Roy’s fellow staff members in the Drawing Office and was able to recall names with ease. Their marriage lasted 65 years. Roy slowed down due to heart problems over the past 3 years and had to be cared for in a Nursing Home for the last half of that time. Some relatives came from Interstate. There were a number of people from groups to which Roy had belonged over the years. Even though I had known Roy closely for at least 20 years, I did not know that he was a devout Anglican and a permanent member of the congregation at St Jude’s for many years. The impressive and historic Church was filled with excellent organ music. Two clergymen officiated. He was also a champion A Grade Tennis player. I should recall that his important contribution to Edgar Harcourt’s book on OTC was acknowledged in the book. If possible I will get a copy of the eulogy and pass it on to you. It was great to catch up with Brian Hayes after about 35 years. I admit his memory is better than mine because he recognized me instantly.